Yes, this fish has spines. Yes, this fish releases toxins. No, that’s not the reason why you shouldn’t touch it, though. You’ll know why you shouldn’t touch it when you find out what it has instead of scales. The mandarinfish has a few good qualities. It engages in a charming mating dance. A male courts several females, until one decides she likes him, at which point they pair off and do a kind of swim-dance together. The fish is one of only two vertebrates that can produce a blue pigment. Most blue-colored vertebrates just layer crystals until they create an interference pattern in outgoing light that looks blue. This one produces blue colored proteins and arranges them in stunning pattern that makes it a favorite among people with home aquariums. The mandarinfish has a few less pleasing qualities. It has spines that will stick the hand of anyone who tries to touch it, and it produces toxins that can be dangerous — especially if they come in contact with open wounds. But these are minor drawbacks. Its main drawback is that it stinks. 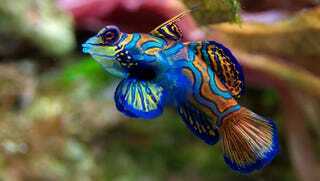 Every scientist and book that talks about the mandarinfish makes mention of its strong, unpleasant smell. That stink is not incidental. The mandarinfish needs the smell, and the spines, because it lacks one of the most basic protective measures in the marine world: It doesn’t have scales. Yep, arguably the most beautiful fish in the ocean, and an anomaly of animal pigmentation, goes around perpetually oozing thick, smelly snot, which it uses to cover its entire body. And yes, some of the fish’s toxins are mixed into its mucus coating. So if you do decide to observe these animals mating underwater, and you feel sick later, you now know what got in your mouth.